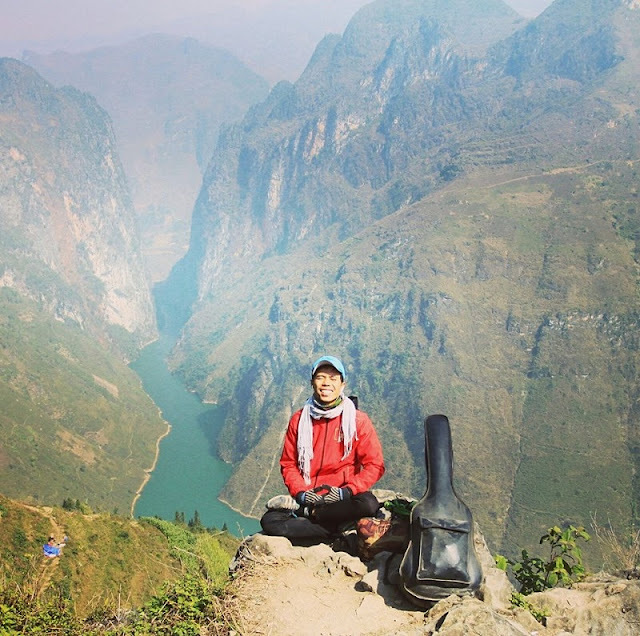 A young Vietnamese man has just completed a113-day hike almost the length of Vietnam. Ho Nhat Ha, 31, from the central province of Phu Yen, loves travelling and had planned the trip to test his stamina and ability deal with problems. He started his journey at the Independence Palace in Ho Chi Minh City on October 18 last year with just VND100,000 (USD4.40) in his pocket. And after 113 days, the young man successfully completed his trip when reaching Lung Cu Flag Tower, the country's northernmost point in Ha Giang Province on February 8. His only possessions on the trip were three sets of clothes, 20 nutritional bars, a hammock, some medicine, and a guitar. "I spent nearly a month practising jogging and mountain climbing before my trip," he said. "But it took a lot of time to persuade my parents to agree with my trip." With such simple preparations, Ha said that the biggest challenge was the cost. "I brought only VND100,000 in cash and had VND1m (USD44) in my bank account," he said. "But I told myself to try to spend as little as possible." And he has succeeded in completing the 113-day walking trip thought out Vietnam at the cost of just USD4.40. "Most of my dinners and breakfasts were offered by local people at the places I passed," Ha explained. "Lunches were mainly nutritional bars and instant noodles. I also wrote and played music with my guitar to earn more money." During the journey Ha walked some 30 kilometres a day on average, starting at 7 am and stopping at 6 pm. One of the difficulties he faced on the way was the weather changes in the different places he passed. "The weather was sometimes so different between areas," Ha remembered. "Right after leaving the blazing hot deserts of the southern coastal province of Binh Thuan, I faced days of prolonged rain in the central region, and soon after that was the chilly cold winter of the northern mountainous region." The young man said that the changing weather together with the pains in the feet sometimes affected his will. "I often had different mood at different time of day," he shared. "In the morning I was always full of energy, but by afternoon exhausted and worried about what to eat and where to sleep that night. Sometimes it was very difficult to find a place to sleep at night as some local people were afraid that I was a mental patient or a criminal. But I set a target for each day and tried to achieved it." Asked about the good memory he got from the trip, Ha said he learned a lot about people and life in different places. "I was inspired a lot after stopping at the house of a disabled man in Hue City and heard about his story," he said. "He was all alone on his birthday that day. I played the guitar and sang a song to him and then we talked a lot that evening. He was amazing and his efforts in life gave me more strength. Then I knew that there's nothing we can't do if we try our best." And the young man has also been rewarded more after the trip by having more new friends who admire him following his trip. "I think what I gain most after the journey is the love from my friends," he said. "A young woman who knows about me and my trip through social networks had given me an air ticket back to HCM City. And many others have sent their congratulations and best wishes. That's a memorable experience."